The senior attorney having been with the firm since 1968, L. Wayne Larson is AV® Preeminent™ Peer Review Rated by Martindale-Hubbell®. Wayne has practiced law in Minnesota since 1964. He is a 1960 graduate of St. John’s University with a B.A. in political science. 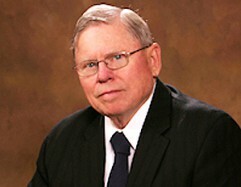 He graduated from William Mitchell College of Law in 1964. Wayne’s experience includes lead attorney in more than 100 jury cases tried to verdict. His current areas of practice include business and commercial law, probate trusts and estate law, municipal/township law and real estate. Wayne is admitted practice before the U.S. Court of Military Appeals, the U.S. District Court, District of Minnesota, and the U. S. Court of Appeals, 8th Circuit. He is a member of the Minnesota Bar Association. He holds the rank of colonel in the Judge Advocate General’s Corp of the U.S. Army (Retired). He was on active duty in the Army from 1965 to 1968 and served in the Army Reserve from 1957 to 1991. Wayne currently serves on the Board of Directors for the local YMCA. He is a past member of the Board of Directors of Rice Memorial Hospital. Wayne has served on the County Planning Commission and County Variance board. He continues to serve other community boards and committees. Wayne is married and has three grown children. He enjoys fishing, hunting and golf.